It’s no secret to my friends and family that I enjoy working with my hands, especially on cars. My house is littered with projects: broken electronics waiting to be re-purposed, dead bicycles ready for new life, and of course several cars at any one time that always seem to need something. Just this weekend I revealed a third car to my friends that doesn’t get out much, the 1988 GMC pickup that I drove to and from high school. With my friends being accustomed to me having two sporty vehicles (already one more than anyone else I know at my age), the truck was met with comments basically alluding to “How many cars do you have! ?” While I love each of these vehicles, they undoubtedly keep me busy with their maintenance, as the newest one is 14 years old, and the oldest is almost turning 30. Fortunately, this means I get a ton of practice fixing ordinary automotive problems such as leaks, window issues, electrical gremlins, and plenty more. Especially with my new efforts towards developing this website and its accompanying social media presence, my friends have become acutely aware that I can inexpensively fix their car issues that would likely cost hundreds to fix at a shop. Luckily, I wouldn’t have it any other way. I hate to see people I care about spend multitudes more than necessary, and making broken things better is one of my favorite past times. I had been trying to meet up with an old friend, Daniel, for quite a while to work on the trunk of his Camry. Somehow the key had gotten broken off in the lock barrel, allowing it to be opened by anything that would fit in the slot. It had been this way for far too long, but he couldn’t figure out a way to get it out, and it wasn’t a deal breaker for using the car. Finally, we got an afternoon to put some time into it. Beforehand we had brainstormed all kinds of ways to possibly get the stub out, ranging from magnets to super glue. I wasn’t hopeful for any of these, but I did bring along a secret weapon my dad and I have discovered for all kinds of random uses. It doesn’t jump to mind as an automotive tool, but it has come to our rescue more times than I can remember for things like releasing stubborn clips, picking grease out of tiny crevasses, or holding tiny gaskets in place. 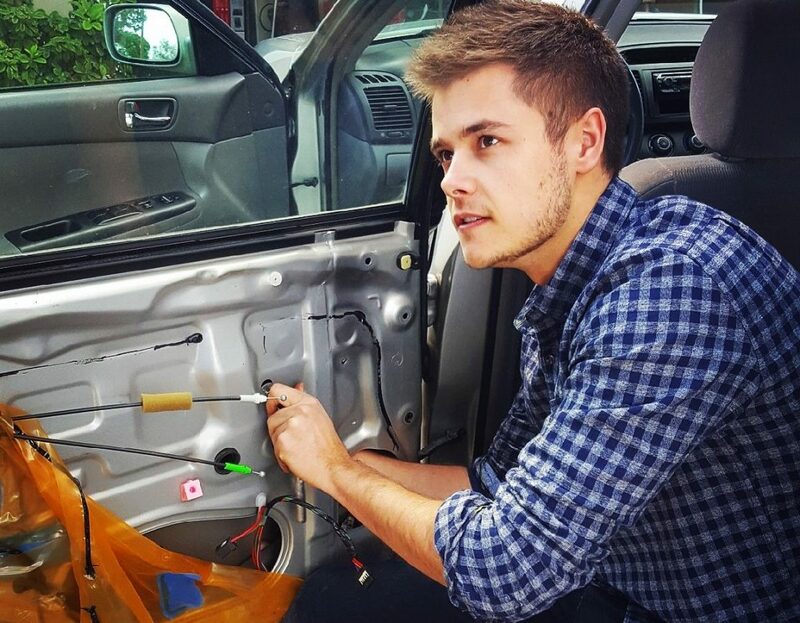 I get cozy with the Camry’s trunk and look inside the lock, and quickly see that I can wedge the pick into one of the grooves of the key and get it to move slightly. After some more wiggling, it Daniel walks away into the garage for no more than two minutes, and by the time he gets back to the car, I toss him the broken key freshly birthed from the lock barrel with a sly grin on my face. He stares at me for a second, his expression a mixture of disbelief and slight frustration. This is what I do. Most of the time for myself, but when I can help someone else who knows less, even better. With the mission of the day accomplished in record time, we took a step back and looked at the rest of the car. For an old Camry it wasn’t bad, but Daniel said that his rear driver side window hadn’t worked since he’s had the car. Already ahead of the game, we dove in. He grabbed me a screwdriver and we started popping off clips and screws. After some fumbling and a few google searches, we had the door panel off. I got as far as pulling the window motor completely out of the door before we thought to check the switch one more time. I plug in the motor as it sits in my hand, and it springs to life when he hit the window switch! Weird. Somehow either the motor or switch had gotten unplugged, and there was no real issue to fix. We put it all back together, made sure it worked one more time, and admired how much we were able to fit into this one rare free afternoon. It feels great to help a friend, and we were able to solve some real problems for free! Next Post: How to Bench Test a BMW e39 M5 Gauge Cluster!